FTC Presents…THE LION IN WINTER – Front Row Theatre Co.
As the sun sets on his reign, King Henry Plantagenet, “the greatest power in a thousand years,” calls his wife, Eleanor of Aquitaine, and their three sons, Richard the Lionheart, Prince John, and Prince Geoffrey, to the palace in order to name his successor. What follows is a treacherous game of thrones, as mother and father face off in a desperate battle to get their favorite son named king. Amidst the corridors of conspiracy and sexual power, a surprisingly intimate family narrative is born, reflecting the inescapable need for love in a family where the word has long since died a thousand deaths, destroyed in the collapse of Henry and Eleanor’s marriage. 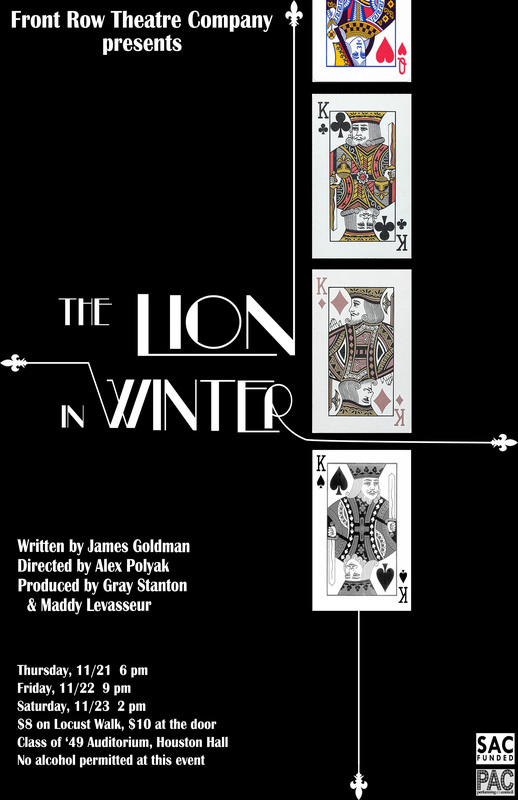 Filled with biting sarcasm and relentless intrigue, The Lion in Winter lives on as perhaps the greatest family drama ever written, about the greatest family that ever lived. Groups of 8 or more, email Maddy (madelynl@sas.upenn.edu) about a discounted group rate! Next Post Auditions and Tech Interviews for Cabaret!